Meet the newest member of the Dodrill Hill barnyard – Rooster! Pearl FINALLY had her first kid a little after midnight. 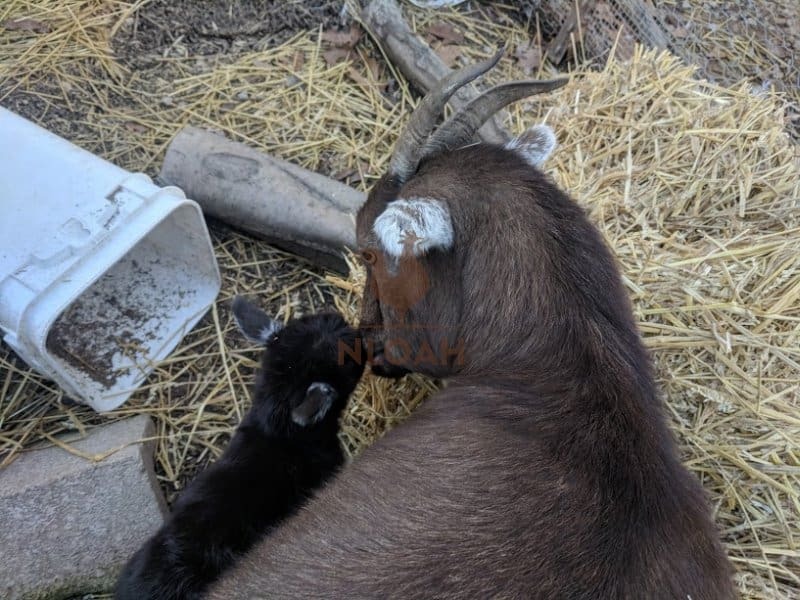 I worried and stressed over all the things that can and often do go wrong during goat births for the past month, but my sweet Nigerian Dwarf girl did it all on her own! My daughter was putting her dog out to potty and swore she heard a baby goat “crying” down at the barn last night. We had been on kidding watch for two weeks, but I was afraid this was just another false alarm – like the 2:30 a.m. trip to the barn the night prior. I went on down to the barn anyway. 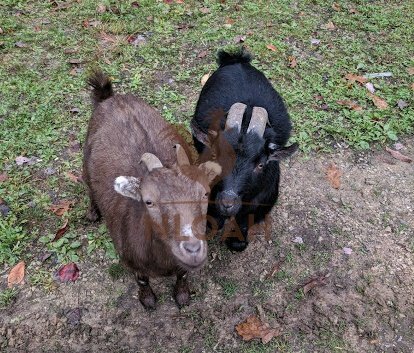 Pearl and her mate, a Pygmy Dwarf goat named, Not Negan, met me at the entrance and seemed just fine and dandy – begging for a treat like always Oh, you want to know why on earth we have a goat named Not Negan? The goat was a birthday gift for my daughter. As soon as I saw him, I reminded me of Negan from the walking dead. A handsome fella, with black hair, attitude in spades, and a way with the ladies. People kept asking what his name was for days, and Brea kept saying she wasn’t sure yet and would roll her eyes and me and add, “his name is not Negan” – as I had been calling him every day during feeding. He answered to the name and Brea never did come up with another one, so Not Negan eventually became the goat’s official name. Pearl and Not Negan. Pearl is definitely the boss of the family. She and my blue heeler Jovie were best friends and followed each other everywhere around the homestead…until Not Negan arrived and Pearl ditched her bestie for cute boy! I came back up from the barn and went to bed. When I went down to feed all of the livestock this morning, Pearl and Not Negan greeted me at the chicken coop, as usual. We free range all of our animals. Me and my little critter parade walked to the barn and into my tack room to open the feed bin (an old refrigerator on the ground) and went about our normal routine. There was absolutely no indication a new goat was in our midst. Pearl jumped into the feed tub and I yelled at her to get out – typical morning routine. Jove ran to where Pearl often likes to sleep and started chowing down on something. At first I thought it was a snake. Upon a closer inspection, I thought it was the goat version of a mucus plug. Finally, Pearl was really getting close to having her first kid…or so I thought. I packed a straw bale over to the spot where she had slept and made her a nice cushy place to give birth later. I crossed my fingers that should would go into labor during broad daylight while we are still in the midst of unseasonably warm weather this afternoon – before it is supposed to get really cold and rain tonight. I always prefer to camp out in the barn when it is not 30 degrees or lower! After giving the chicken and duck flocks the daily warning about what predators to watch out for and reminding them to look after each other so we don’t lose anyone today, I handed out hay to the horses and mini donkeys, and was heading back to the house to start writing. Before I got past the last barn gate, I head crying. I paused, thinking maybe it was one of the pullets. Yesterday Bess, one of the mini donkeys, stepped on the foot of one of the pullets when she followed me back to the feed tub (the minis free range too, so I keep a lock on the feed to prevent self-service) and the young chicken let out a blood-curling scream. Luckily for the pullet, they were standing on soft and muddy ground and her foot wasn’t harmed much when I lifted Bess’ hoof off of it – she was not about to budge from the feed tub in case it magically opened again. I opened the main barn gate and walked inside to see if I had a hurt chicken when I heard the cry again. That is when Jovie and I both knew there was something new in the barn. My Ruby was standing in the adjacent open stall looking down at the baby goat who was sitting in an empty feed tub. Jovie ran through the horses to get around to the minis stall where the baby goat was. 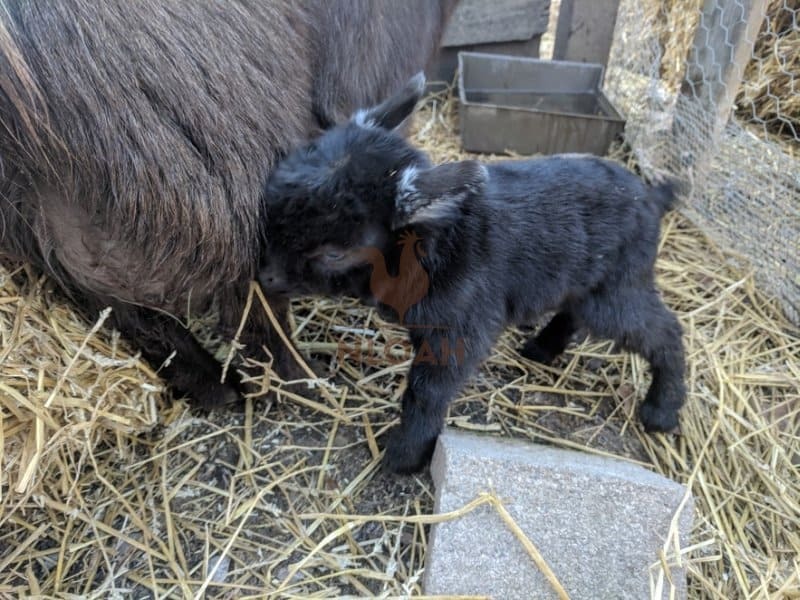 Afraid Jovie would hurt the baby goat, I grabbed onto a wall support and jumped over the half wall into the minis stall to grab the little goat. I ducked under the stall divider and walked out the closest gate – temporarily forgetting I had left the other gate open. I think the herd was too in shock at seeing me jump over the wall to rush out the gate and head to the upper pasture – they love to free range too! I put the baby goat in the chicken run that also serves as an outdoor brooder. Pearl, exhibiting no maternal instincts at all, was headed down to the pond with Not Negan and the mini donkeys. I called her back and coaxed her inside the run too. Thankfully, once she was inside, she cleaned up her baby and allowed it to nurse. I lugged the straw bale I had moved earlier into the covered run and made them a sleeping area to use until I situate them into their own safe spot in the barn later this afternoon. The flocks came over to greet the new arrival and Not Negan is pulling sentry duty around the run to protect his new little family. That tiny goat apparently spent the entire first 8 or so hours of its life surviving on its own, probably without eating. Because it has such grit, I decided to name him Rooster – after John Wayne’s “Rooster Cogburn” in True Grit. 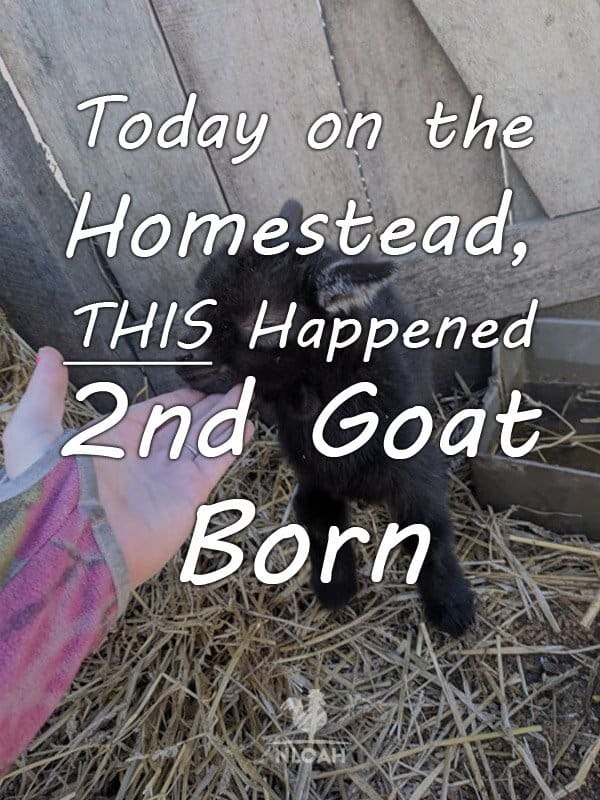 What’s your most unusual homesteading barnyard birth story? I have never liked goats but that little critter is adorable! Congrats to the new baby parents! And good save jumping over the fence! Thank you Sandra! I was never a fan of goats before we got Pearl and Not Negan. Wanting a way to take care of weeds and brush that did not involve extra work or fuel, along with the desire to make our own cheese and soap, prompted their purchase. 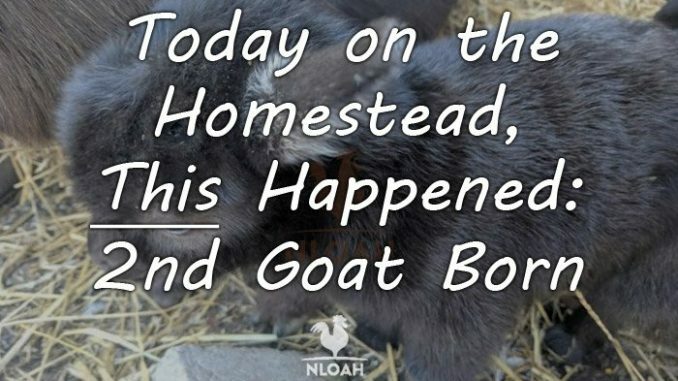 I was strongly opposed to getting goats that still had their horns, but the goats needed a new home and the price was right, so I decided to give them a try and am so glad I did! 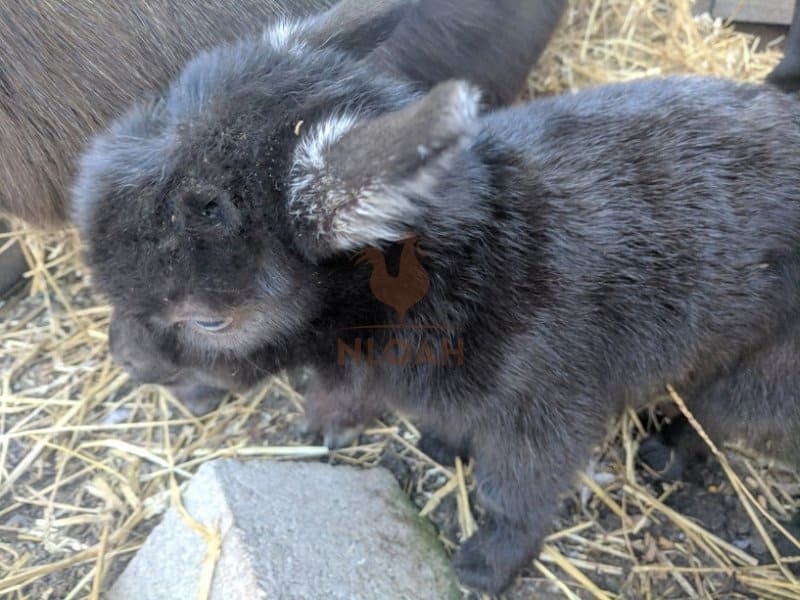 Rooster is a hyper little thing, he hops around more than a bunny and is constantly playing inside the birthing/nursing pen. Every day the rest of our herds and flocks swing by for a visit and he puts his little nose through the cattle penal fencing to give his new friends a hello!